Sheffield United manager Chris Wilder has placed David Brooks at the heart of his plans for next season, rebutting claims the Wales international will inevitably be sold to finance a summer recruitment drive. Citing the fact that all of Bramall Lane’s leading names are tied to long-term contracts, including the £15m rated youngster, Wilder suggested he is under no immediate pressure to sell. 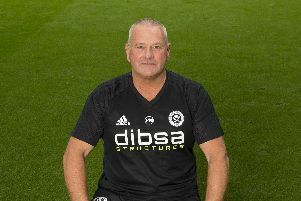 Although he acknowledged the financial might of Premier League teams could change that scenario, Wilder confirmed United’s coaching staff plan to build their squad around the likes of Jack O’Connell, John Fleck and Brooks, who has attracted admiring glances from Bournemouth. “They are contracted to our club and I want to keep all of those players” Wilder said. “Everybody understands in football, if someone comes in with a head-turning offer and is something we can’t afford to turn down - for the player just as much as the football club - then there’s a decision to be made. Earlier this year Brooks, 20, saw his progress halted by glandular fever. But Wilder, together with his assistant Alan Knill and head of sports science Matt Prestridge, believe the youngster will have recovered fully by next season. Although Chelsea’s Jamal Blackman is a candidate to fill the vacancy which exists alongside fellow goalkeepers Simon Moore and Jake Eastwood, United’s scouting department is known to be analysing a number of alternative options. Blackman’s parent club Chelsea are viewed as a rich source of potential talent after striking-up a good relationship with United during their negotiations about the 24-year-old last summer. The FA Cup winners are expected to place the best graduates of their academy system with EFL sides next season.